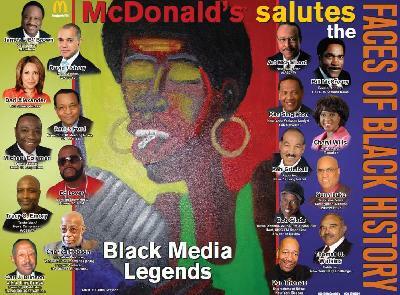 *McDonald’s, the premier fast food dynasty, kicked off its Black History Month celebration by recognizing the achievements and talent of eighteen Black Media Legends who have impacted the Black community through their achievements and positive examples. McDonald’s salutes the Faces of Black History luncheon took place in New York at the tony Waldorf Astoria Hotel on Park Avenue on Tuesday, February 2, 2010 where the leading food supplier also unveiled the 2010 Faces of Black History poster featuring the media legends. 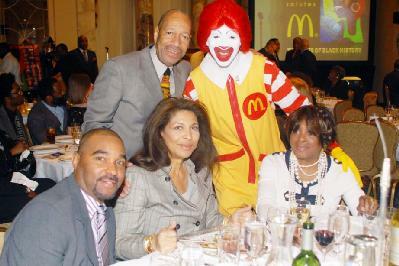 The annual salute to McDonald’s Faces of Black History marked the seventh successful soiree coordinated by A. Curtis Farrow, president & CEO, Irving Street Rep. Inc., and hosted by New York Tri-State Area McDonald’s Restaurants. The exceptional event was created to honor Black History makers throughout our community and our country, from Dr. Martin Luther King Jr. and Rosa Parks to present day heroes/sheroes. After blessings from Archbishop Eugene Blount, of The Elim International Fellowship, Brooklyn, New York, the heroic honorees and their special guests dined on Organic Greens (Caramelized Endive, Oven Roasted Tomato, Goat Cheese Brule, Honey Lemon Dressing); Pan Roasted Organic Chicken (Sweet Garlic Whipped Potatoes, Haircuts Verts, Chicken Jus; Chocolate Savarin (Cremeux Chocolate & Chocolate Gateau Breton, Hazelnut Mousse Crunch, Chocolate Mirroir, Cocoa Nibs and Nougat Tuile, Caramel Sauce). Additionally, Pete Samaha, president, PR committee & McDonald’s owner/operator, and Linda Dunham, chairman, RMHC Global & McDonald’s owner/operator, representing Ronald McDonald House Charities, participated in the brief program presided over by co-hosts Sandra Bookman (ABC-TV), Lynne White (former anchor, WB11) and Brenda Blackmon (My9 WWOR-TV) who received a special recognition award from McDonald’s owner/operator Ron Bailey who noted Blackmon’s twenty years of excellent reporting at WWOR-TV. 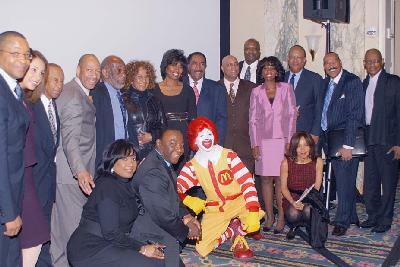 Other participants in the stellar program included media presenters who were accompanied by a McDonald’s owner/operator in handing out the awards — the likes of Pat Battle, Johnnie Bailey, Marian Etoile Watson, Alisa Harrison, Kent S. John, Brian Hairston, Chris Cottrell, Dawn Mussenden, Gwen Edwards, Cortesia Norman, Allen Norman, Anthony Johnson, Nellie Thomas and venerable radio personality Hal Jackson. Previous ArticleCoffee Break Moments of Inspiration: What Are Your Motives?